It’s no secret that I’m an oil addict, and body oils are something I absolutely kick myself for forgetting when I pack for trips. I have no patience for body lotion (and don’t use the hotel body stuff anyway, ew) and prefer the slick and sheen that body oils deliver. 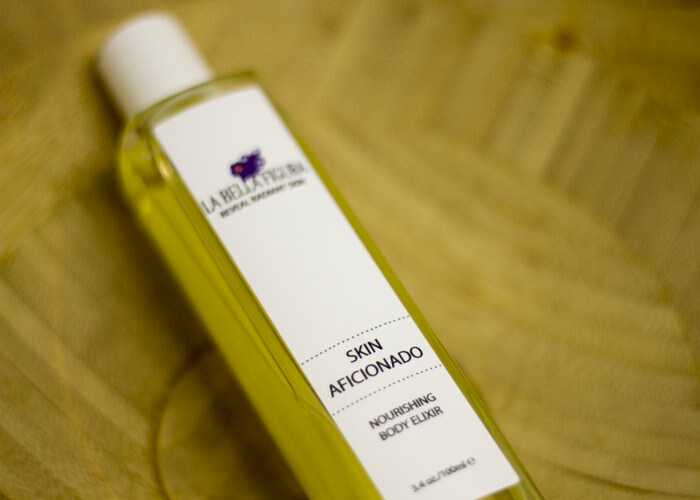 A new body oil (well, OK, I’ve had it since September but I like to take my time) in my rotation is La Bella Figura’s Skin Aficionado Nourishing Body Elixir. La Bella Figura Skin Aficionado Nourishing Body Elixir is one of my go-tos for days when I want a subtle scent but amped-up moisture and a bit of indulgence to start my day. I don’t wear a ton of perfume anymore (though I’m rounding up new natural favorites), but on days when I do add a little smell-good potion, I don’t want my body oil to compete. That’s where this lovely body oil comes in — it’s got all the nourishing, beautiful ingredients but an extremely soft, sweet scent thanks to grapefruit, mimosa and ginger. It sounds like a lot of citrus, but I think the ginger is cutting though it, and the concoction of outstanding carrier oils — camellia, sunflower, meadowfoam — helps keep the scent light while giving your skin plenty of moisture. My only concern with this oil is the price. It’s expensive. I tend to like expensive things (body oils included — another one I adore but wear sparingly and definitely for the scent), but I know a $90 price tag is a bit hard to swallow. That said, the ingredients list looks very solid to me. “It” oil camellia does not come cheap, and it’s No. 1 on the list. It’s definitely responsible for the suppleness I see in my skin during these cold, cold days and nights. Bottom line: Would I buy this myself? Probably not. I go through body oils so fast that I need something a little more economical. I could easily put the $90 toward a few other favorites from La Bella Figura (like this, this, this and this). Have you tried La Bella Figura Skin Aficionado Body Elixir? What are your favorite body oils? How much will you spend on a body oil? Tell me in the comments section!